Individual Development and Social Change: Explanatory Analysis represents a convergence of three lines of emphasis now visible in developmental research and theory building. The three are (1) the life course as a focus for the study of development and social change, and their interrelationships; (2) the life-span orientation to the study of individual development, with its acknowledgment of the salience of contextual features for understanding development; and (3) the growth of methodological innovations that provide more appropriate and powerful ways of exploiting data gathered to describe and explain developmental change processes. The book opens with a study on how major cultural change originates and unfolds over time. 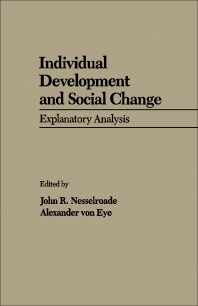 This is followed by separate chapters on the use of sequential designs for explanatory analyses; evolutionary aspects of social and individual development; the concepts of the theory of causal and weak causal regressive dependence; and the concepts of age, period, and cohort from the perspective of developmental psychology. Subsequent chapters examine development and aging as lifelong processes of historical populations; the methodological integration of natural and cultural science perspectives in developmental psychology; and application of the multifaceted methodology to the mutuality of constraint between sociocultural group and individual dynamics.